The first settlement at Port Dover, where the Lynn River empties into Lake Erie, was known as Dover Mills, due to the river’s mills that were a crucial part of the village. On May 14, 1814, roughly 750 Americans landed near the Lynn River during the War of 1812 in what is now known as the Raid on Port Dover. The following day, the troops marched to Dover Mills where they burned the settlement’s houses and mills, and shot the livestock. Israel Powell started a new settlement at the mouth of the river in 1835, but it wasn’t until a road was opened to Hamilton, that the population increased significantly. The first lighthouse at Port Dover was erected in 1845, but it accidentally burned down on November 5, 1848, forcing the keeper to hoist two globe lamps atop a pole for the remainder of the shipping season. 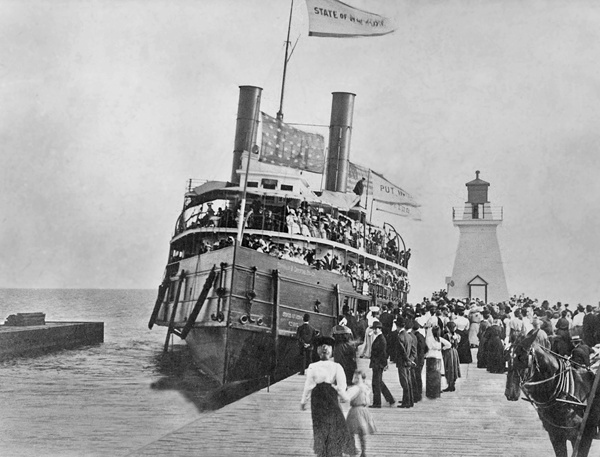 The first rails reached Port Dover in 1875, when the Port Dover and Lake Huron Railway commenced service between the west side of the harbour at Port Dover and Woodstock, Ontario. Three years later, the Hamilton and Northwestern Railway extended its track to Port Dover, creating a station on the east side of the harbour. In the 1880s, these two railroads were acquired by the Grand Trunk Railway, and operations were consolidated on the west side of the harbour. 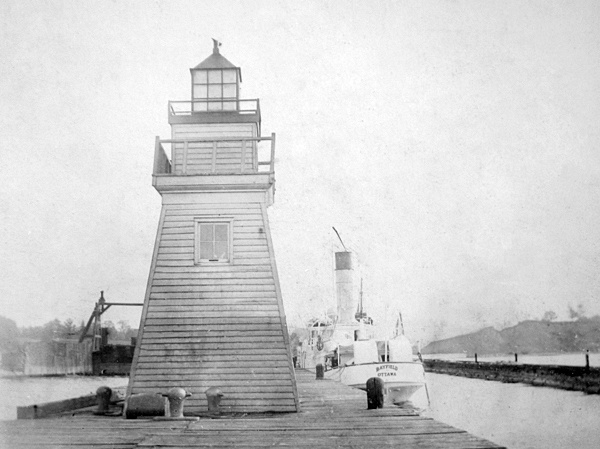 For the accommodation of the car ferry boats running all the year round between Port Dover and Conneaut, it was found necessary to establish a second light at Port Dover which, in range with the light on the outer end of the west breakwater pier would lead in to the railway wharf through the best channel. The design adopted for this lighthouse consists of a skeleton steel frame work surmounted by an inclosed wooden lantern, the whole painted red and 45 feet in height from the base to the vane on the lantern. The light, which was put in operation on the 11th June last, is fixed red catoptric, elevated 45 feet above the lake level. The building was erected for the department by Mr. W. H. Noble, foreman of works, who procured the steel work from Messrs. Rice Lewis & Son, Toronto, and had it put together at the Saint Lawrence Foundry, Toronto. The total cost of the building was $386.65. The tower stands on an unused part of one of the streets of the village, and permission was given to the department by the municipality to use the site. In 1904, the lighthouse on the west pier was taken down so a new and improved tower could be built. 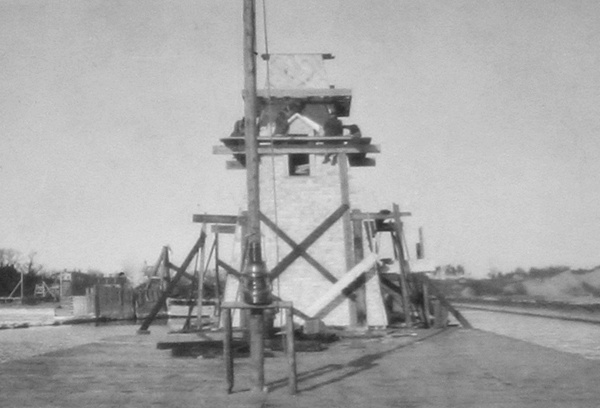 While this work was underway, a lens lantern was hoisted atop a temporary pole erected fifty feet lakeward from the lighthouse. 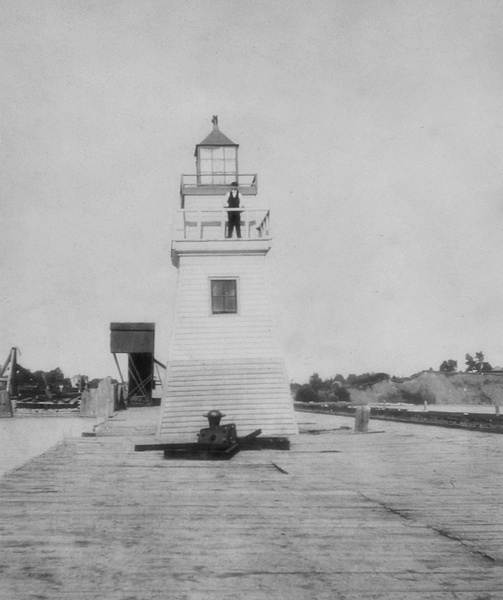 The following description of the new lighthouse was published by the Department of Marine in 1905: The tower is an inclosed wooden building, square in plan, with sloping sides, painted white, surmounted by a square iron lantern, painted red. It is 35 feet high from its base to the top of the ventilator on the lantern. The light is a fixed white dioptric light, of the seventh order, elevated 34 feet above the level of the lake, and visible 11 miles from all points of approach by water. The illuminant is petroleum vapour burned under an incandescent mantle. This work was done by days' labour under the superintendence of Mr. M. J. Egan, at a cost of $1,155.87. 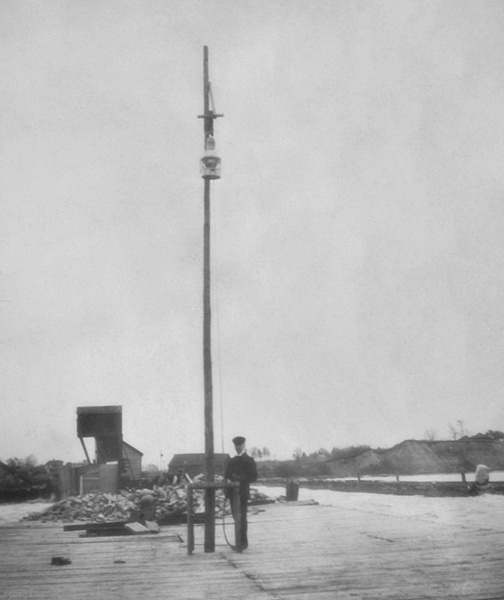 On July 17, 1916, the rear range light was changed from fixed red to fixed white to make it more conspicuous against its dark background, and in August 1921, the front light was changed from fixed white to fixed red. The range lights were electrified in 1923 and both made fixed red. 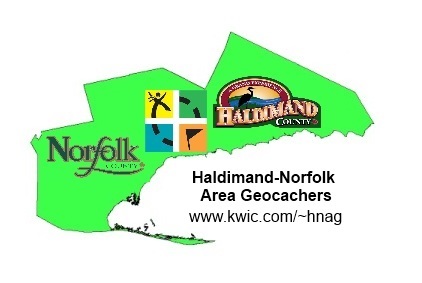 Their characteristic was changed to green in 1936. A hand-operated foghorn, used to answer signals from vessels during periods of limited visibility, was established near the outer end of the west pier in 1927. This served until 1940, when a tyfon horn, sounding a blast every twenty seconds, was placed in the front range lighthouse. The 1905 lighthouse remains active on the west pier, displaying a flashing green light, but the companion rear range light has been discontinued. Mariners can activate a foghorn in the lighthouse by quickly clicking their radio mike five times on channel nineteen. The horn will then stay active for thirty minutes. Not wanting to lose the iconic lighthouse that serves as a symbol of Port Dover and the county, Norfolk County accepted ownership of Port Dover Lighthouse in 2014, after the Canadian Coast Guard declared the structure surplus. To help clinch the deal, the government provided $25,000 to help offset future maintenance, which, including insurance, is expected to be around $3,000 each year. Port Dover Lighthouse was designated a Recognized Federal Heritage Building in 1990. Keepers: William Fifield (at least 1849 – 1860), William Carlisle (1863 - ), Henry Morgan (at least 1866 – 1888), Crosbie Morgan (1888 – 1891), John A. Innis (1891 – 1894), Andrew Innis (1894 – 1897), Silas L. Butler (1897 – 1924).